I LOVE Olive Garden. It’s a good thing that I live two hours from the closest one or I would have gained about 50 lbs and spent mucho dinero at that place by now. I can’t say I’m in love with any particular pasta dish. It’s the breadsticks and salad that do me in. I love bread, what can I say?!! Beer Bread, Rosemary Bread (this is the Macaroni Grill bread recipe, YUM!) It’s the perfect accompaniment to any meal! 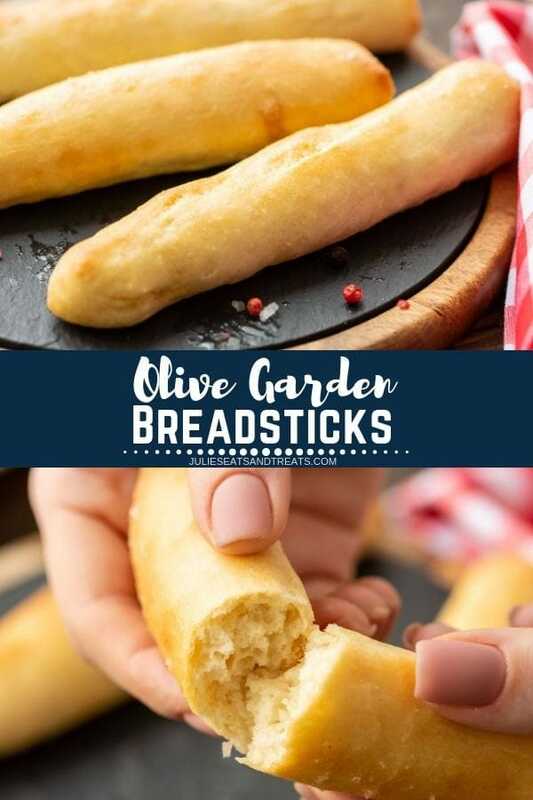 Now I’ve found the perfect recipe to cure my breadstick craving when it comes to Olive Garden. I’m just going to have to find the dressing and salad recipe for Olive Garden now! I think the key ingredient in these breadsticks is the sea salt so this is your warning if you don’t have sea salt go buy some! These are super simple to make. Remember I’m scared of yeast! They do take a while to prepare as they have to rise etc. so please plan ample time. This is your warning because one night I was in a hurry and attempted these and it backfired. Good thing I gave them a second chance when I had more time! Also, the recipe makes quite a few breadsticks, so I halved the recipe. 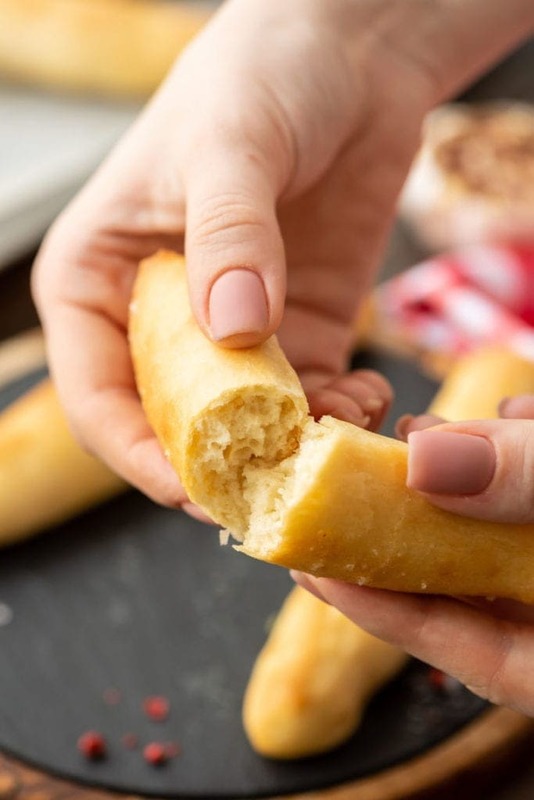 How do you store homemade breadsticks? This recipe does make quite a few, so if you do have leftovers and need to store them allow them to cool completely. Then wrap them in foil and again in plastic and store them in the refrigerator. How do you reheat bread? Wrap the breadsticks in foil to protect the crust. This will keep the crust from burning but allow the inside to reheat. 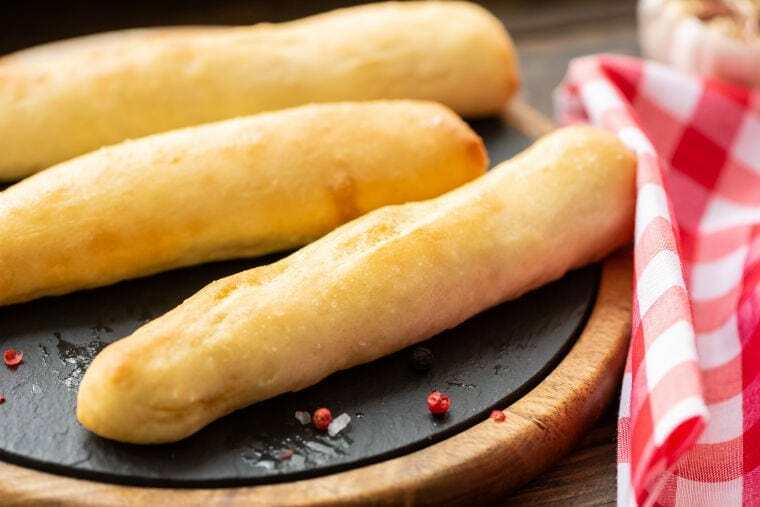 If you reheat it without wrapping it in foil first, the breadsticks will be hard – ew!! Start by giving yourself plenty of time. Between making the bread, allowing time for the dough to rise and baking it takes almost an hour. And it’s totally worth it! The time needed is not all hands on. Pour the water into a stand mixer with the sugar and yeast, allow to sit until frothy. Add salt, butter, and 2 cups of flour. Using a dough hook, mix it on low. Add the remaining flour a half cup at a time, until dough scrapes the sides of the bowl clean. Mix the dough about 5 minutes on medium speed, until its smooth and no longer sticky. Roll the dough out into a long log, cut the dough into 12-14 pieces. Roll those pieces into about 6-inch logs. Spray cookie sheets with cooking spray, and lay the breadsticks out leaving about 2 inches of space between each one. Place them in the oven with the temperature turned to 170 degrees. Let them rise for about 20 minutes, or until doubled in size. Once risen, brush them with the 1 1/2 T of melted butter and sprinkle them with sea salt. 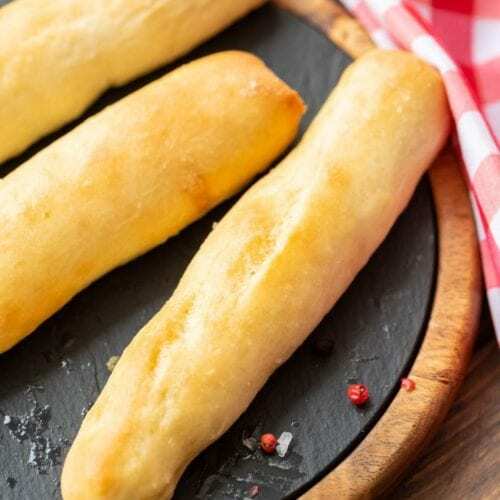 Bake the breadsticks and bake or until golden brown. Remove them from the oven and brush with the remaining butter/garlic mixture. Serve while hot! So yummy!! 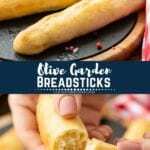 What to serve with Olive Garden Breadsticks? Olive Garden Salad of course! YUM! What a meal, right?!!! Be sure to give this recipe a try! If you love this sliders recipe as much as we do (pretty sure you will! ), be sure to leave a five-star rating below! 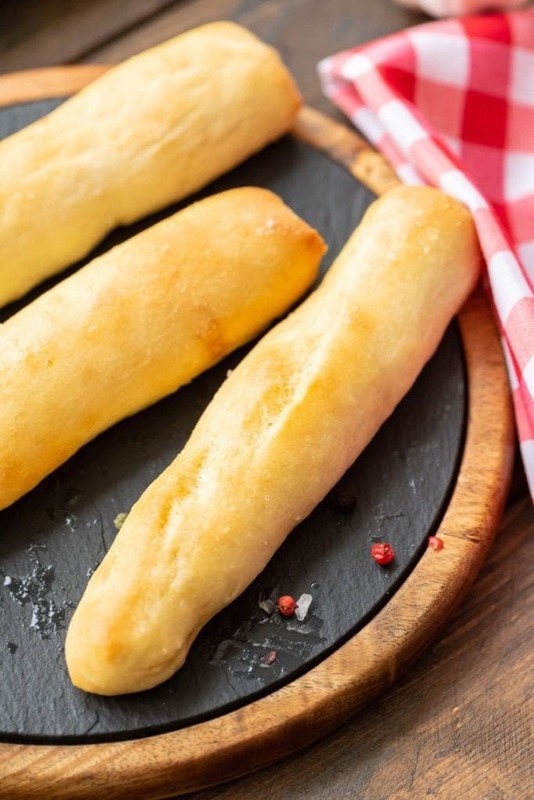 Light, fluffy homemade Olive Garden Breadsticks with just the right amount of seasoning! 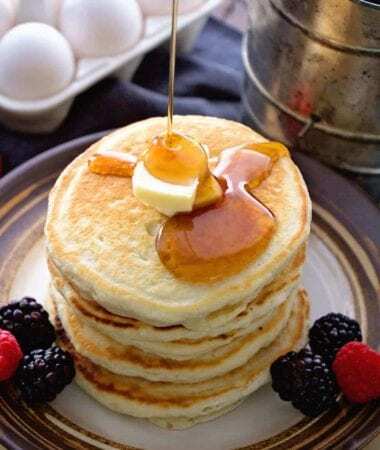 You'll love this easy recipe! Add salt, butter, and 2 cups of flour. Mix the dough on low. Add the rest of the flour a half cup at a time, until dough scrapes the sides of the bowl clean. Mix the dough about 5 minutes on medium speed, until its soft and easy to work with. Roll the dough out into a long log, cut the dough into 12-14 pieces. Roll those pieces into about 6 inch long snakes. Spray 2 large cookie sheets with cooking spray, and lay the breadsticks out leaving about 2 inches between each one. Place them in the oven with the temperature turned to 170 degrees. Let them rise for about 20 minutes, or until doubled in size. Once risen, brush them with the 1 1/2 T of melted butter and sprinkle them with salt. Preheat the oven to 400 degrees and bake them for 12-15 minutes or until golden brown. While they are baking combine the rest of the melted butter with 1/4 t garlic powder. When the breadsticks are golden brown, remove them from the oven and brush them with the butter/garlic mixture. Girl after my own heart! These things are my FAVORITE! Oh how I love bread. I look forward to trying these. Olive Garden breadsticks are deadly good! Julie, I can’t seem to find the point value on your recipes. Are they available? I’m sorry Linda I don’t do WW values on my recipes! I am wondering what type of yeast is used in this recipe? I am excited i can make those breadsticks at home now! My kids love them! Give me all the OG copycats! I love making these at home!